The date is set, the caterers have been booked, the invitation cards have gone out, and you have found the perfect wedding outfit. Now all that is left is hiring the best Makeup artist in Chennai to make sure that you look flawless as you sit at the Mandap or walk down the aisle to your beloved fiancé. Planning a wedding is often a stressful affair for the bride to be and her groom. This can cause a lot of tension that comes out in the form of pimples or skin rashes. Hiring the right makeup artist can help you implement a makeup routine that will help soothe your skin for the upcoming events. Every bride undergoes an emotional turmoil as she gets ready to become the wife of the man of her dreams. She is getting ready to leave behind her single life and start on the track to marital bliss far away from her family and loved ones. An experienced makeup artist understands the different emotions that a bride to be is going through, and help ease her through the process of getting ready by getting her involved with her skin routine, daily cleansing routine and so on. Having a trial session days ahead of the main event will also help the bride to be to calm her nerves as she goes through the makeup routine and decide the styles to be implemented for each function associated with the wedding. How To Recognize A Professional Makeup Artist From A Novice? There are plenty of top notch makeup academies in the city that produces brilliant makeup artist every year. At the same time, a lot of self-taught makeup artists are also on the lookout for new clients. 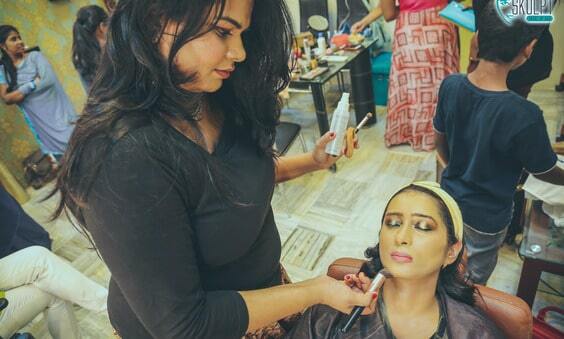 If you are not sure whether the makeup artist you are planning on hiring has the right credentials or not, all you need to do is check which makeup academy in Chennai they have listed as their alma mater. Another way of spotting a professional makeup artist is by taking a look at their portfolio. If the portfolio is filled with plenty of photographs of their work taken by professional photographers, you can be rest assured that you have found the right deal. However, if the portfolio is filled with selfies of the artist in different makeup looks, it would be a good idea to start looking for a new makeup artist. Professional makeup artists are also very concerned about the type of lighting used while applying makeup as natural light can change the look while being photographed. However, novices are not aware of this fact, leading you to own a huge wedding album filled with photographs that do not meet your expectations. References are another way to find a profession makeup artist who will do their job professionally as per your requirements. You can ask your friends and families to pass on any contact information of recently hired makeup artists who have done a good job, thereby making the task of hiring a makeup artist an easy one.